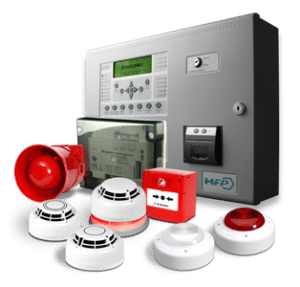 If you require a dependable maintenance company to manage your fire alarm system or you require a knowledgeable & meticulous contractor to design, manage, install or commission your new installation MJ Fire Safety is the company for you. Whether it’s a small quarterly service or a large brand new installation our service technicians & installers have the required technical training (in accordance with BS5839) and the management and customer relationship skills to meet your needs. Furthermore they are able to work on conventional, addressable, wired, wireless or hybrid systems. We pride ourselves on delivering a first class service on time, every time. Please feel free to ask us for testimonials from existing clients for confirmation of our high level of standard. MJ Fire Safety are approved installers of Electro Detectors, EMS and Hyfire radio fire alarm systems. We also have long-standing relationships with numerous other leading fire alarm manufacturers. We offer a professional service in both service and installation. Our project managers, technicians and office staff are always on hand to provide the necessary guidance or updates. Our 24 hour (365 days a year) call out service provides on-site assistance and technical advice in any event. We will ensure you have complete peace of mind knowing your fire alarm system is in safe hands. MJ Fire Safety provides bespoke fire alarm maintenance packages that are individual to your needs and budget. Whether you need a complete new fire alarm system, want to update your present system or are looking for a repair or maintenance contract. Call our proactive staff today.